New dockless bike-sharing has arrived in the nation's capital, which will make life easier for people in search of a temporary pair of wheels. WASHINGTON — Bike sharing has become a popular, convenient way to get around the nation’s capital — if there’s an available bike nearby. 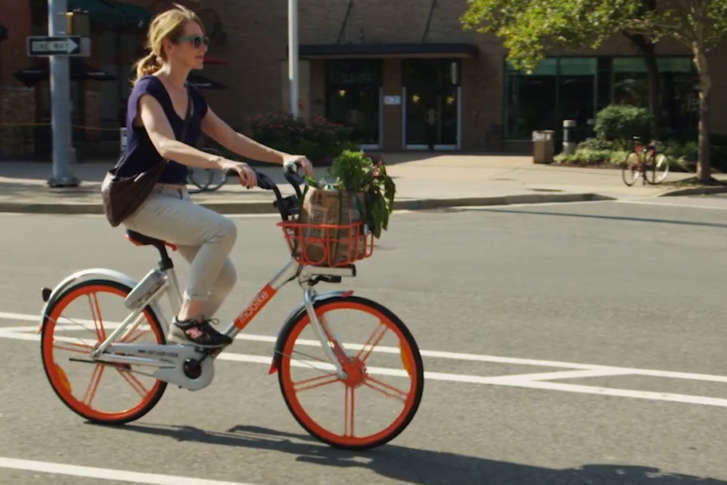 Until now, people in search of a temporary pair of wheels have had to look for a Capital Bikeshare rack, but three dockless biking systems are pedaling into the District as part of a 6-month pilot program, including Mobike, which launches Wednesday. After a user downloads the Mobike smartphone app, a phone’s GPS is able to locate the nearest available bike, which is generally parked in a public bike rack or on a sidewalk. With a click, an available bicycle can be reserved for 15 minutes. Scanning a QR code on the bicycle unlocks the bike, which can be pedaled away. At the end of the trip, the user flips the bicycle’s lock, which emits three beeps and ends the ride on the smartphone app. The first 200 bikes will be distributed near D.C. Metro stations, university campuses and public parks. A 30-minute ride costs $1 — half as much as the $2 half-hour ride on Capital Bikeshare. Mobike says its bikes will stand up to urban life, with an aluminum anti-rust frame, chainless shaft drive and non-puncture airless tires. The company estimates each bike will have life span of four years. The app instructs users to park at public bike racks or on a sidewalk, not obstructing pedestrian traffic. “Mobikes should never be parked in private bicycle parks, within a compound, within a residence, or inside an underground parking space,” according to the company. Two other dockless bikeshare companies, Spin and LimeBike, plan to launch this month in the District as part of the pilot program. In a statement, D.C.’s Department of Transportation said the new privately-run dockless businesses will provide more bikes for people who might want to ride. “Such technology has the potential to expand the number of bikeshare bikes in the District and to provide access in areas DDOT hs not yet been able to add bikeshare infrastructure,” said the agency.